Remember June's special sale on greetings! No limits and get them on any order type (workshop, customer, or online). I have been meaning to share this card for awhile, but it just kept getting pushed back in the "queue". A friend came over awhile ago for a stamping day, and she had this idea for using the Paper Doily Sizzlits L Die on a gate fold card. 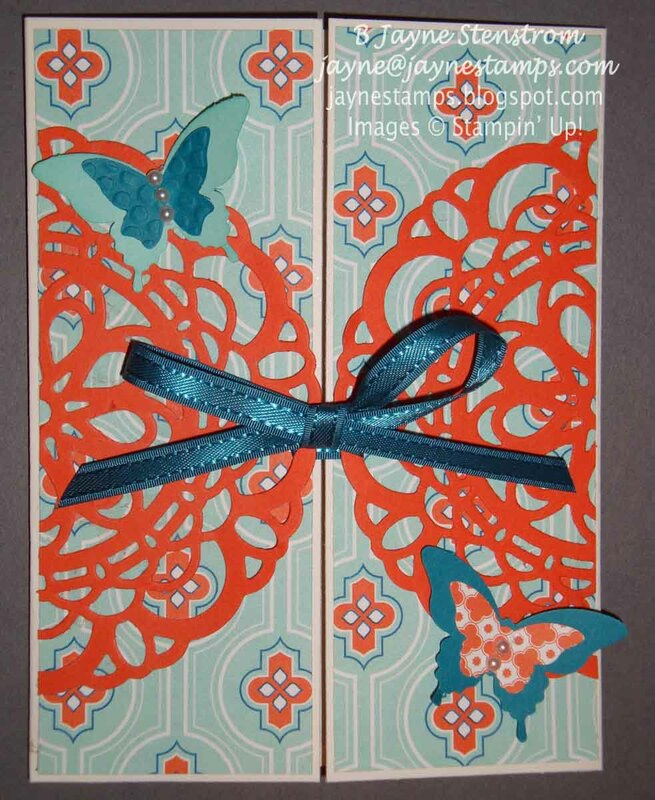 I happened to have one of the doilies already cut out using Tangerine Tango card stock, so I got working with what would go with that and came up with this card using the International Bazaar DSP from the recently retired catalog. The other card stock colors used are Whisper White, Pool Party, and Pacific Point (or was it Island Indigo?). Well, one of those blues anyway. The ribbon is from Sale-a-Bration. What do you think? 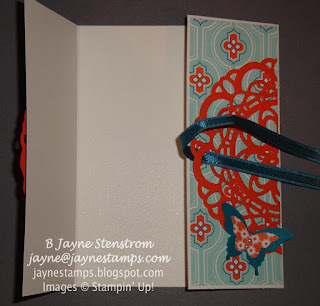 The doily is attached on the outside edges, but the ribbon is threaded through a couple of the openings at the center so the card can be tied closed. I added some butterflies punched with the Elegant Butterfly punch and the Bitty Butterfly punch, and the Beautiful Wings Embosslits (still one of my favorites), and accented them with Basic Pearls. I was pleased with the end result.